Wedding season, summer vacation, snow cones, and all the other summer delicacies, overshadows a less appealing virtue of the season that people often fail to plan for—hurricane season. From June 1st to November 30th, the land touching the Atlantic Ocean and Gulf of Mexico is left vulnerable to one of nature’s most destructive forces, hurricanes. The raise in temperature coupled with wind patterns can generate something as small as a few inches of rain to a monstrous storm. On the scary side of the spectrum, hurricanes can have winds exceeding 156 miles per hour. Winds of that magnitude can turn a tropical tourist destination into a wasteland of fallen trees and buildings. The worst part, people know the imminent danger of hurricanes, but because they fail to plan for it, they leave themselves completely exposed. Take Louisiana, Mississippi, and Alabama (Gulf Coast States) for example. On Friday afternoon, the National Weather Service issued an emergency broadcast forewarning the arrival of hurricane Katrina. It was never a surprise that a hurricane could hit anywhere in the Gulf, but despite all warnings, the following Monday morning the Gulf Coast States were rudely awakened. That morning Hurricane Katrina swept through the coast leaving hundreds of thousands of people in peril. An estimated 2,000 people died and $100,000 billion dollars of damage was left in Katrina’s tracks. Sadly, had the people and states properly planned for the storm, casualties and monetary damage could’ve been heavily mitigated. Unfortunately, the lack of preparation wasn’t just evident at the time the hurricane hit, but also in the months that followed. New Orleans, in particular, failed to account for the hurricane’s residual effects such as flooding and energy blackout, leaving the city to perish and people without food and water. The underlying issue that exacerbated the situation was that the majority of people’s preparations only scratched the surface of what they had to expect and plan for. They didn’t know they’d be left without electricity, transportation, jobs, sufficient insurance coverage and government support. Therefore, had people known of everything they needed to plan for, and had they acted on their plans, their lives could’ve continued normally. Much like the victims of Katrina, people also generally fail to plan adequately for their old age. Most people approaching 65 years old tend to only plan for social security benefits or who will take over their assets. But that’s no more than putting shutters up on a window and having food and water reserves enough for a day. In fact, they fail to plan for all the things they don’t know that could also happen after their biological clock hits 65. Here is where an attorney or a personal representative could come into play for ample planning utilizing the power of attorney (“POA”). Power of Attorney is basically the power to act on one’s behalf, utilized for financial or health decision making. Most commonly, the POA is durable meaning that the POA is still active even if the elderly person becomes incapacitated or mentally ill. Although this POA feature may appear to be a general facet, it is only delegated when it’s included in the agreement. 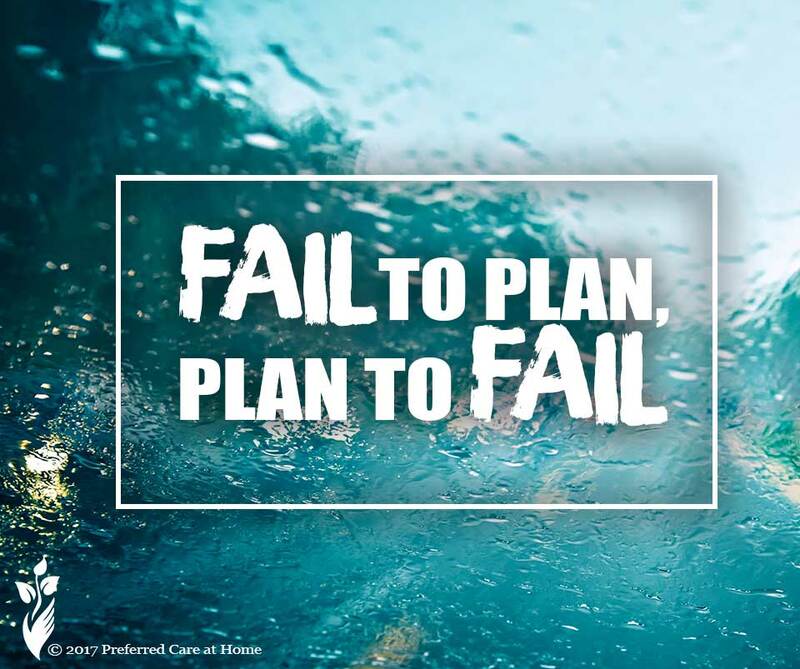 Therefore, in the quite literal sense of the phrase, if you fail to plan or fail to include the durable provision in the POA agreements, then you are implicitly planning to fail. Where the future is unknown, one should always approach it with the upmost care. That is why attaining an attorney’s guidance or delegating someone with the Power of Attorney can be vital for one’s future well-being. This can help resolve issues that are often overlooked. For example, one might have a will reflecting one’s wishes, but it might be invalid if it’s not the proper type. Also frequently overlooked is the plausibility of incapacitation. Regardless of how gloomy this may read, accidents and life happens, and sometimes not in one’s favor. Therefore, one should always assign someone the Power of Attorney or carefully plan for someone to care for them in the event of a tragedy or sickness. One can be proactive and begin by narrowing down home care services for their elderly years. It’s essential that one has a reliable home care service in mind, so that way when the day comes that one is a home by oneself, it’s not chaos at the door but a friend to care for you. So plan for the future, don’t fail to plan unless you’re planning to fail.